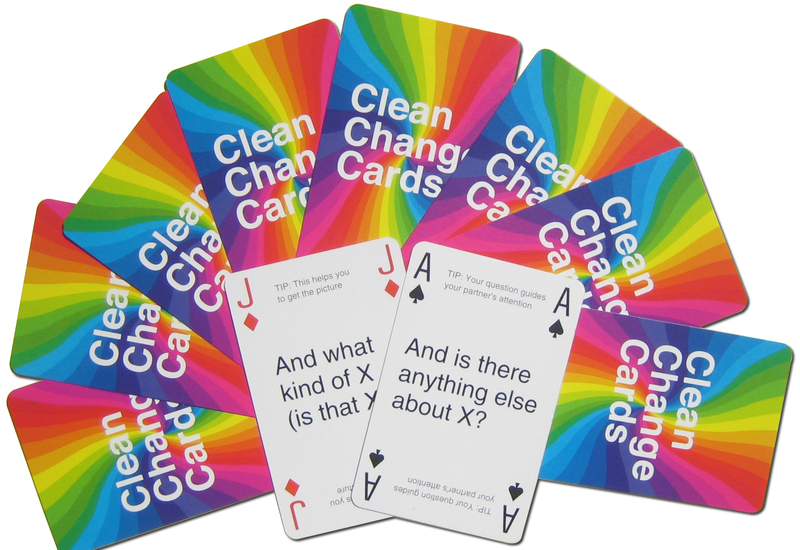 These cards may look like ordinary playing cards, they're actually a multi-functional learning tool designed to help you master Clean Language. Great for beginners with no previous knowledge of Clean Language required. 1. They're great for helping you to memorise the Clean Language questions, so that you always have them on the tip of your tongue to use in conversation. Why not use them to play solitare, relaxing your conscious mind into the game while your unconscious grasps the precise wording of each question? 3. Work (or play!) with a partner to practice your Clean coaching easily. You can let the cards decide which question you'll ask next - all you have to choose is which of your partner's words to ask the question about. 4. Need some coaching on a specific issue - but your untrained frined is the only person about? Hand them the cards with a brief explanation, and you'll be away! Tester Noemie Dehouck said: "This game can really help beginners (and others!!) to save a lot of learning time thanks to your "tips"." Tester Brian Birch said: "I gave them to my fiancée and she can now coach me well, with minimal exposure to Clean Language." Another tester handed them to his PA: she coached him over the phone and achieved instant results!